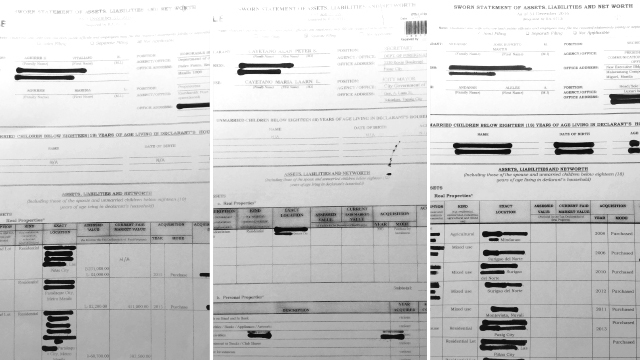 Why is MalacaÃ±ang Censoring Key Data From Cabinet Membersâ€™ SALNs? Two days before President Rodrigo Duterte’s first State of the Nation Address last year, he signed Executive Order No. 2, series of 2016, or the Freedom of Information (FOI) Order. Widely praised by his allies and foes alike, the order mandates all government offices under the Executive branch to provide full public disclosure and access to information, records, documents and papers involving all government transactions and decisions. Yet, a little over a year after the issuance of EO No. 2, the Malacañang Records Office (MRO), an agency that is part of the Office of the President, appears to be honoring the order more in the breach that in strict observance. When Entrepreneur Philippines, an online business news and features site under Summit Media, requested copies of the statements of assets, liabilities and net worth (SALN) of members of the Duterte Cabinet, MRO partially acceded to the request after more than a month. It released the SALNs of only 29 Cabinet members, saying that the rest are still under review. Moreover, it redacted or blackened out key data from the asset disclosure statements that it released. Among the censored information are the addresses of residence, office and businesses; acquisition costs of assets such as real and personal properties; outstanding balances of liabilities; and names of the officials’ children under 18 years old. 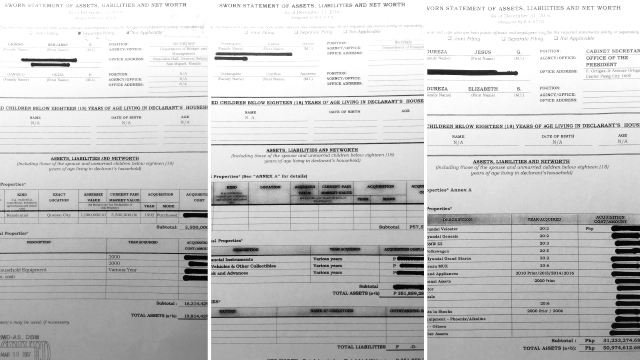 Entrepreneur Philippines routinely asks government agencies for copies of their key officials’ SALNs in preparation for articles on the their net worth and business interests. Among the recent stories we have written based on officials’ asset disclosure statements are the ones on Senator Emmanuel Pacquiao and on former Finance Secretary Cesar Purisima. The scale of the redactions looks unprecedented. 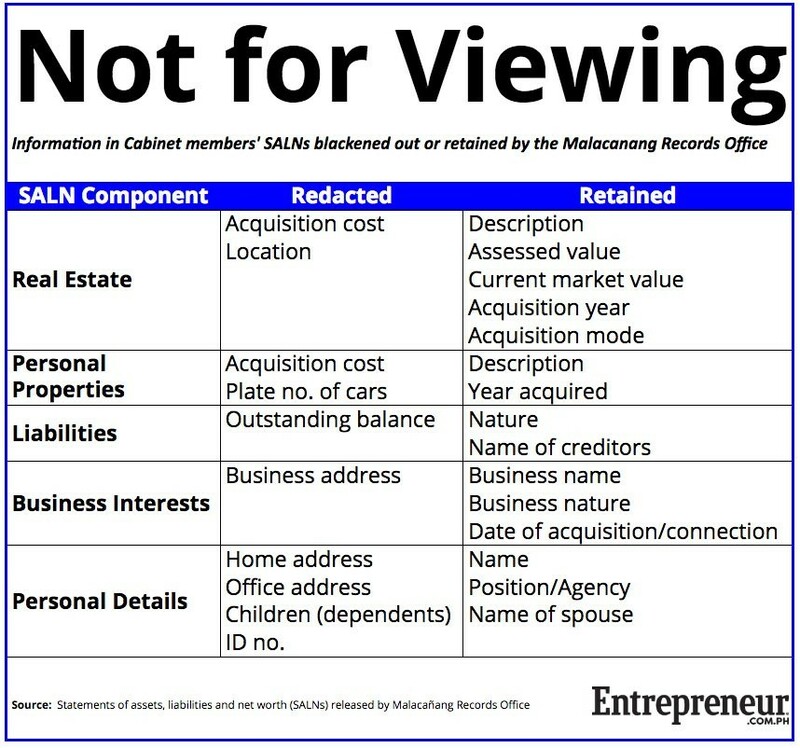 While other government bodies such as the Office of the Ombudsman also blacken out personal addresses in SALNs they release to journalists, the MRO’s redactions cover far more essential information than usual. A staff member at the MRO said the redactions were only implemented recently, as instructed by higher officials. Entrepreneur Philippines got hold of the SALNs in mid-August 2017. Prior to that, the SALNs released by the MRO did not contain any redactions, according to the staffer. Apart from the redactions, the MRO is also withholding the release of SALNs of some Cabinet members, particularly those belonging to the Office of the President. “The Office of the President (OP) is still in the process of finalizing the review and compliance procedures (RCP) of the SALN, disclosure of business interests and financial connections (DBIFC) and identification disclosure of relatives (IDR) with respect to the officials and employees of the OP Proper,” said Atty. Concepcion Ferrolino-Enad, Director III-Acting Head of the MRO, in a letter. Related story: (PCIJ) Unexplained wealth, redacted?